Home » Uncategorized » Having Some Tuscan Fun! 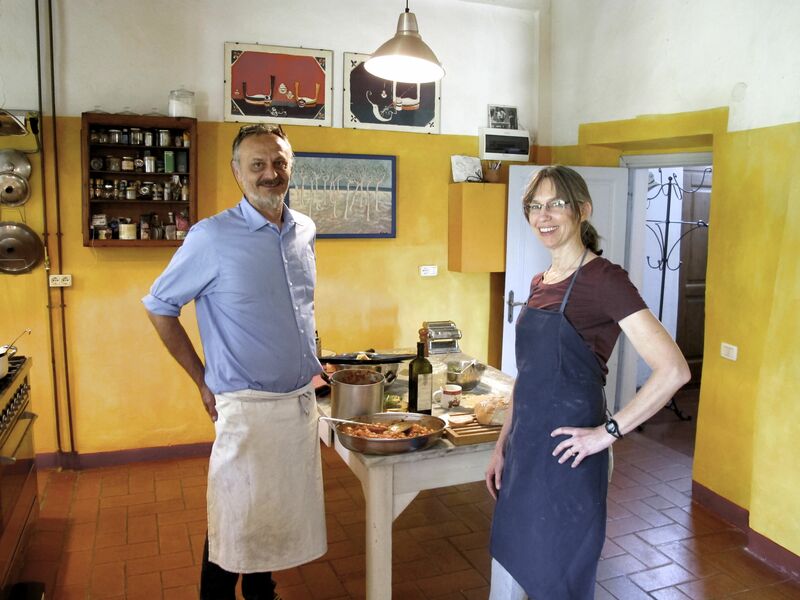 Posted by Chef Bev on May 26, 2015 in Uncategorized | Comments Off on Having Some Tuscan Fun! Just back from an amazing trip to the hills of Tuscany! For years, my husband and I have been thinking about going, but you know how life gets in the way. Finally, we realized that unless we took action, our plan was in grave danger of becoming just a pipe dream! Oh, and did I mention I have a cousin that lives there? How gracious and wonderful Nan was to open her lovely home in Tavernelle and cart us all over the place as we oohed and aahed over the jaw-dropping scenery, architecture and art. One of the highlights of the trip was a cooking class by talented Chef Jacopo Tendi (check “Let’s cook with Jacopo and Anna” on Tripadvisor). We made a slew of Tuscan delectables: Artichoke Salad, Spinach and Ricotta Ravioli with Butter and Sage, Gnocchi with Tomato-Basil Sauce, Rosemary-Sage Roast Pork Loin with White Sauce, and Caramelized Onions. And then we ate. And ate. And ate. YUMMM! Here I am with Chef Jacopo. If you ever have the chance to go to Tuscany, I’d recommend you’d jump at it! And be sure and schedule a cooking class that you’ll never forget! Here’s my recipe for Tiramisu, a Tuscan classic. Without permission, I can’t share Jacopo’s, so there’s one more reason to take his class if you ever have the opportunity! Chill egg whites until needed. Mix egg yolks with kahlua, vanilla and 1/2 tsp of the espresso. Whisk egg yolk mixture, adding sugar gradually, until sugar is dissolved and the mixture drops off the whisk in a ribbon. Add mascarpone and beat until very thick. Beat egg whites until stiff but not dry. Fold into the yolk mixture. Whip cream until stiff and fold into the egg mixture. Pour espresso into a rimmed dish and briefly dip both sides of lady fingers in one at a time, arranging half of them in the bottom of an 8″ x 8″ pan. Top with half the cream mixture. Repeat with remaining lady fingers and cream mixture. Chill for at least two hours, dust with cocoa and serve.